GEMINI® is a Complete Jewelry Business Management System for One or Hundreds of Locations Using Robust Microsoft® SQL Server Technology. 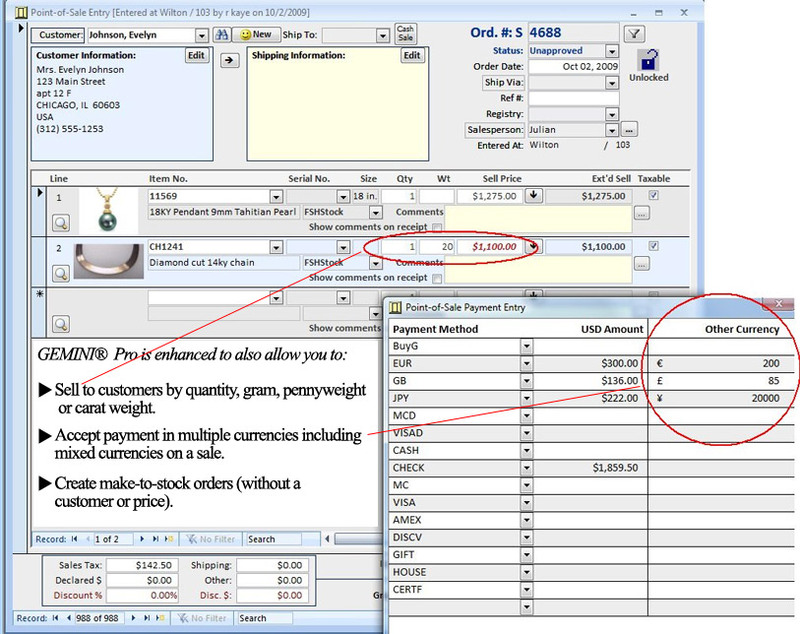 GEMINI® Pro Point of Sale screen showing sell by weight and multi-currency. The GEMINI® special order screen allows you to create customer orders for repairs and special orders, set up estimated labor and materials, print job bags, control component inventory via issues and de-issues to orders. Users record and control job costs by entering actual labor performed. GEMINI® analyzes estimated vs. actual labor, and materials for you. GEMINI® Pro includes enhanced diamond price management that can import ‘Rap’ formatted diamond tables from your Rap subscription. You can compare and update your prices based on your criteria. GEMINI® has a complete Diamond Master system. GEMINI® Pro adds the ability to import and update diamond prices globally or individually. Subscribers to Rapaport can import diamond prices as often as desired and compare them to current diamond prices. With Diamond Parcel Allocation you can sort out and categorize a parcel. After sorting goods, GEMINI® Pro compares parcel value vs. standard cost per carat and calculates discount, automatically. *Some scales may require 3rd party software to interface to Windows; available at a nominal extra cost. MPI Systems, Inc. is a Microsoft Partner ISV (Independent Software Vendor) Partner.